I received a package from Martha Stewart Crafts and to be honest the Martha Stewart Crafts Pine Needles Trim Double Edge Punch was the thing that got me the most excited. I've seen different designs at the craft store but I had never used one until now. The cuts are really clean and making a trim only takes a few punches. 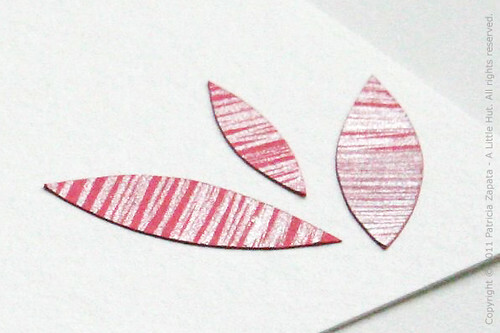 It really couldn't be any easier to create this embellishment. Even my little C added some trim to an angel that I made for her to put on our tree. Can't you see this on all sorts of projects? 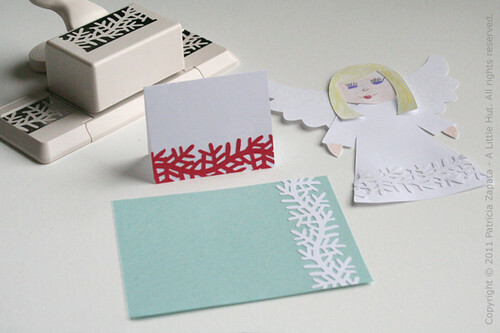 Cards, scrapbooking, gift wrapping... the uses are endless. Martha Stewart Glitter Markers were another lovely surprise. The ink is metallic and it has glitter in it. Very appropriate for this time of the year. 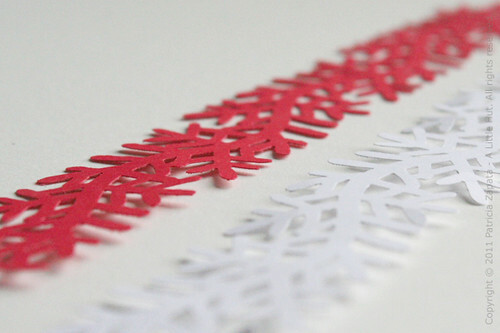 Christmas decorations, cards and gift tags will be spiced up with these. 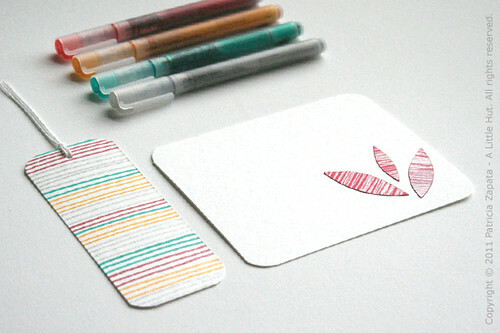 This is a four pack of red, yellow, green and silver markers. All I did was zig-zag the marker back and forth over the red paper. Then I cut the leaves out after the ink was dry. Very easy and I love the look. The kids have been using scraps of paper as bookmarkers (blasphemous in a crafty household—but they take after me!) so the striped version will definitely be for them. I decided that this Christmas I am going to make a serious attempt at baking something other than the usual cookies I make—so when I saw these boxes I had to grin. They came just in time. 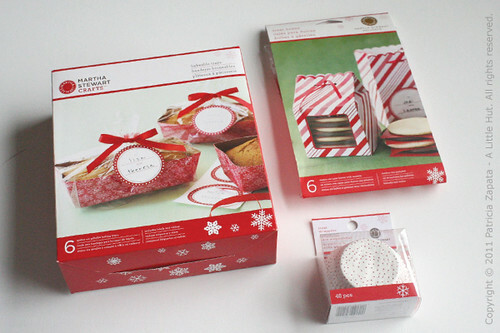 For those of you that don't bake I think the Candy Cane Boxes or the Bakeable Trays would be a cute way to give someone some treats (maybe a gift card tucked in there too!). Little C has already claimed the Treat Wrappers—so there is some duo-baking coming my way. My waistline? Ahem. Yes, I'm just going to pretend it doesn't worry me for now. For US residents: The Martha Stewart Crafts products can be found at Michaels and JoAnn Fabric and Craft stores.